Remember pining to go to a slumber party that was never as much fun as it was supposed to be? Well, the girls who came to the GNO Slumber party this month got more than they could ever bargain for: great breakfast foods and snacks, a discussion on dreams from the perspective of Judaism, a great movie and they even made clothes pin dolls! November 6 saw women from across the Jewish community of Broome County come together for a morning of friendship, education and inspiration. This year's program featured a fascinating dramatization of the lives of two remarkable women: Dona Gracia Nasi ( 1510-1569) and Gluckel of Hameln (1646-1724). Our very own Marcy Yonaty ( Dona) and Meri Pell-Preus (Gluckel) bought these women in the our hearts and minds in an absorbing and deeply impactful manner. Reliving the 90's was the theme of this semester's second Cafe nite. Participants enjoyed the great pastries, live music and the chance to simply chill out with friends. What's strenuous, involves exposure to the elements and possible pelting but is loads of fun? A paintball trip through Chabad, of course which is exactly what an enthusiastic group enjoyed this past Sunday. Talk of another trip is already in the works. Students at Chabad for the weekend of November 4-5 enjoyed a Shabbat they will not soon forget. NY based alumni, Stu '00 and Stacy '01 Mayer joined us in Binghamton for the weekend. Stu led rousing services and an Oneg. He also shared the miraculous story of how he and Stacy came to be parents of four boys all born within one year. On Shabbat, Seudat Shlishit 180 saw a huge group turn out for the third meal replete with delicious desserts, a light dinner and spirited singing. The already awesome Shabbat was capped with a musical Havdallah ceremony that was followed by spirited dancing. In a moving and joyous celebration , 7 BU students who had not marked their Bat/Bar Mitzvah as younger men and women, marked their Jewish coming of age with family, friends and the larger Jewish community at Binghamton. The Bnai Mitzvah attended a series of classes with Rabbi Levi Slonim leading up to the ceremony and many are continuing to do so even after the celebration. For a video clip of media coverage of this event click here. There are some things that never get old. One of those is a Challah Baking Workshop with Hadassa. An especially interesting component of the workshop was watching how flour was made from actual wheat kernels. Mixing, kneading, shaping and eating the Challah was fun too! At the GNO/Guys Night Out Mixer participants enjoyed mingling, great refreshments, some torah thoughts on relationships, speed dating and the Newly Wed Game. It was an evening made in heaven! jLearn classes have given over fifty students the opportunity to study diverse aspects of Judaism in convenient mini-course style this semester. At the banquet marking the end of this Jlearn semester participants expressed how meaningful these classes have been to their developing thought process on what it means to live as a Jew. Delicious chocolate fondue, an inspiring Havdalah ceremony, and spirited discussion of the Jewish perspective on love, intimacy and marriage made for a wonderful evening at Chabad Downtown. Hundreds of students took a break from their studies to join in a pre- Chanukah celebration which served as the climax of the month long Chanukah toy drive. Chabad students together with SAE and STD spearheaded the drive that raised more than $8,000 with which toys were purchased. The toys will be distributed by volunteers from NY based organization, Chai Lifeline, to ill children in hospitals in the NYC area. The celebration showcased the toys and included delicious Chanukah treats, Chanukah songs, and a performance by the Crosbys. Parting is such sweet sorrow at Chabad: bagels with assorted shmears, omelets, pancakes, smoothies and more, helped dull the pain of leaving for the hundreds who crowded Chabad for the traditional midnight madness finals week breakfast. Take heart: in a few weeks we'll be back together again for an even more wonderful semester ( is that even possible?) together. and education making it a trip that lasts a life time. 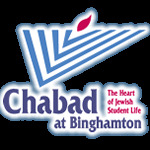 Hundreds of students celebrated being back in Binghamton for the Spring semester at Chabad's Sushi event. The Sushi, soups, salads and desserts were a hit but the real excitement was generated by the pervasive sense of community. To view the video of this event click here. A taste of Israel in Binghamton! Students enjoyed spending time with friends and a delicious Israeli spread. Tu B'shvat festivities at Chabad was a lot of fun and enjoyed by all. Participants enjoyed a wide variety of fruits and nuts, grape juice and an outrageously fun chocolate fondue while learning ancient mystical teachings concerning this Jewish holiday and the various fruits eaten on this day at the Seder led by Rabbi A. Slonim. Participants also enjoyed Plantings and Edible Centerpieces led by Rochel Chein; everyone had a blast making their own centerpiece and learning the basics of planting. Skiing in an (almost) Snow-less Winter! any snow has fallen all Winter, on the morning of the Chabad-Hillel Ski trip the white stuff fell creating a magical back drop for the annual ski trip. A great time was had by all. David Nesenoff, the journalist who exposed Helen Thomas, appeared in Binghamton to talk about his experience and show the documentary film he produced in the wake of that incident. In his film, Three Thousand Miles, he shows the ugly face of bias and the many forms it takes. Nesenoff captivated a full house of students on Friday night as well as on Saturday night when he led a spirited Q and A session after the movie screening.